Fighting depression is something I’ve been doing since I was a teenager. It’s definitely not a one and done kinda thing; it’s an ongoing battle. Some days I feel really successful and other days I’m just taking things one day at a time. I have an extensive family history with depression and I’ve had several situational episodes too. I’ve kind of learned to be in tune with my mind and my body and now I can usually feel when things start to go bad up there (in my brain, lol). I definitely don’t always know what I’m doing — far from it — but once in a while, I’ll just sit down and force myself to think of the things that make me happy in life. It’s simple to do and helps to focus on that sometimes. If you experience depression it’s almost like you have to work extra hard to be happy; you have to make a conscious effort almost all the time. This is something that continues to frustrate me but there’s really nothing I can do to change that so I just keep learning and doing what I know. Over the years I have learned to pay close attention and be proactive as best I can during the “rough seasons” (long Minnesota winters, Diesel passing away, stepdad passing away, kids growing up, etc.) but processing grief is definitely a challenge for me — probably the hardest thing. I sometimes compare having depression with having diabetes to make it feel a little more “normal”. Obviously, the two are vastly different but there is a similarity. Diabetics rely on insulin. They’re always having to monitor blood sugar and need to watch what they eat or they could be in big trouble. 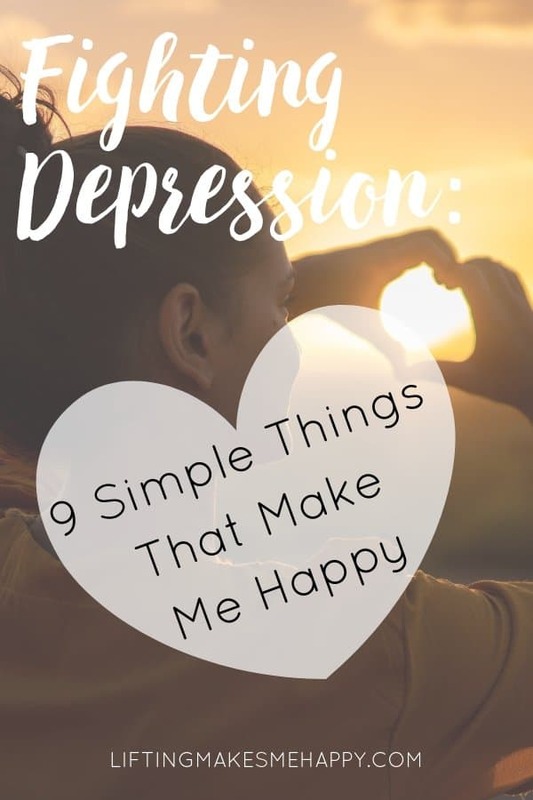 Likewise, if I don’t consciously practice certain things, take certain medications, monitor my moods and keep up with workouts and personal development, my depression is happy to make an appearance. There are a lot of things in life that make me happy: my husband, my children, winter giving way to spring and my favorite music just to name a few. But today I’m going to list actual things — simple things — that make me happy and help me fight depression every day. Sometimes it really is all about the simple things in life. I encourage you to think about what makes you happy too. My barbell. My barbell is 45 pounds of steel, can’t get much simpler than that. Using a barbell to perform strength training exercises makes me feel powerful, confident and strong. When I first started working out with my husband we shared a barbell but for the last several years I’ve had my very own and I love her! Dumbbells. While I do love my barbell, I also like to use dumbbells sometimes. I prefer dumbbells for arm and shoulder exercises and while they aren’t as big in size, they do make me feel strong. I like variety in my workouts and having dumbbells allows me to do a huge variety of strength exercises. Weight bench. In order to get the full range of motion while doing chest presses, I love having a weight bench. It comes in handy for chest exercises using weights, but also for bulgarian split squats, step-ups and decline push-ups. Journaling. Journaling helps me put everything into perspective. It’s also a nice way to have a brain dump. Just getting things out of my head and onto paper can make me feel less anxious and less stressed. It helps me see things more clearly and settle the F down. Pens. I don’t really know why but good pens make me happy. I guess this is probably because I enjoy writing and I prefer pens to any other writing tool. My favorites are Pilot G2’s and PaperMate Gel Pens. Treadmill. Our treadmill isn’t my favorite thing but it allows me to run in my home and running makes me happy. I don’t enjoy running but I do enjoy how it makes me feel in the moment and I feel really amazing after I’m done. It’s another thing that makes me feel strong and like journaling, it has a way of clearing my head and reducing anxiety too. I’ve come up with some of the best ideas I’ve ever had while running. It’s weird. Water bottle. This might sound dumb but if I don’t carry a water bottle around, I won’t drink nearly enough water during the day. I love my 32-ounce CamelBak. Personal development. Personal development has been a serious game changer in my life. I wish any of the therapists I had sessions with over the years would have suggested personal development books for me. Obviously, some of the exercises they had me do were kind of like personal development but I never really knew personal development was a thing until I became a Beachbody coach. Crazy right? I will always be grateful to Beachbody for stressing the importance of personal development.